After many years on a bike and no less than 11 stage victories, Chaleco López has not taken long to grab his first in his new category in an SxS. The Chilean has narrowly won the second stage in San Juan de Marcona after the superb comeback by general standings leader Reinaldo Varela who finished just 19 seconds behind Chaleco. Sergey Karyakin takes third place, 1’51 behind the day’s winner. 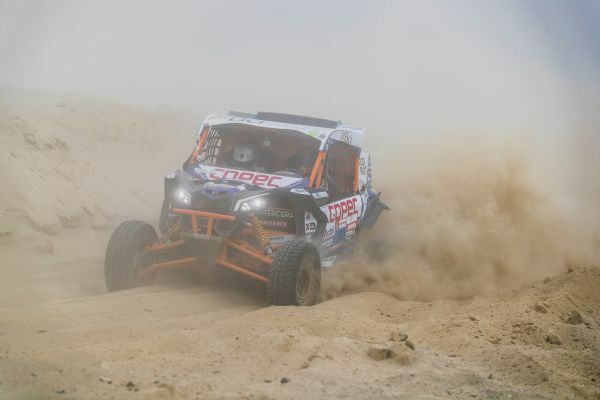 Chaleco López is determined to show that he is just as comfortable on four wheels as on two. The former biker has got the knack of his Can-Am and leads the stage in the SxS category at CP2. The Chilean is 1’13 ahead of Sergey Karyakin (who has made the switch this year from the quad category).